Logic dictates that if you want to eat the best Peking duck, you need to go to where discriminating palates demand the best out of their Chinese delicacies: The San Gabriel Valley. And according my discriminating friend Kenny (who lives in SGV), and Jonathan Gold, a guy trusted for his discriminating tastes, the place to get Peking duck is Duck House. Gold lauded it back in 2006 when it was called Lu Din Gee. He rhapsodized that their version was "fragrant wisps of air-dried, roasted skin, rubbed with aromatics, brittle as spun sugar, folded into thin wheat crepes with a dab of fermented bean sauce and a few shreds of scallion, and eaten as a sort of ethereal taco." 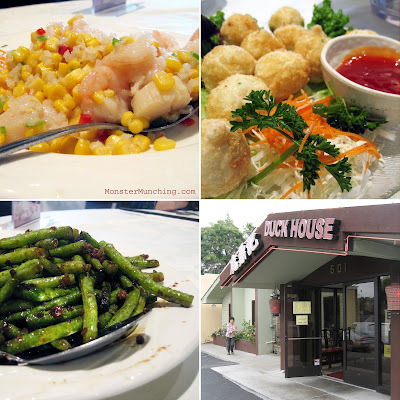 So I heeded their tips and found that Duck House is otherwise and essentially a Taiwanese restaurant, serving mostly subtle dishes like shrimp stir-fried with scallops, corn nibblets, and diced translucent jelly called konjac. The latter are slippery bits of starch that are near impossible to pick up with chopsticks. We also tried elastically resilient fried squid balls filled with fish roe. You dip 'em in a sweet and sour sauce, and balance their chewiness and decadance with an order of some sort of veggie. But of course, there's the duck ($32 and change for the basic model). First of all, before I go on, I will address the obvious: No, Taiwan isn't known for its Peking duck (duh). But this place doesn't care so much about being geographically accurate. And neither does its customers. Everyone orders the duck. This despite the fact that the waiters give you dire warnings that the bird takes an hour to prepare. I must tell you, however, that even after they told us and we agreed to wait, the platter came out scarcely minutes after said we wanted it. It's like they knew! And when it's brought out, the mahogany brown of the skin's wispy crispiness makes your mouth water at the mere sight of it. In the middle of the plate in a neat greyish mound is the duck meat. The whole dish is literally elevated above everything else you might order. The platter is set atop a bowl full of hot water, which I assume is used to prevent the whole thing from congealing and reverting back to the room temperature fattiness from whence it came. To eat it, you take a crepe-like wrapper they provide (which is not unlike the most delicate flour tortilla you've ever seen) a piece of skin, a piece of meat, shredded scallion and cucumber, and finally a drizzle of their fermented bean sauce, from which most of the flavor comes from. You fold it up, and you do, in fact, eat it like a taco. Was it the best Peking duck I ever ate? Why yes. But admittedly I haven't eaten that many. Most have been lackluster, chewy things. This was not. The skin is a thin, lovely shimmer of itself, rendered completely of fat and crisp like it was imitating a potato chip. But honestly, I'm a pork skin kind of a guy. I like my animal hides to have some heft, some rock-my-teeth crunch. Duck skin is a tease. Compare them to a Chinese roasted pig, or Filipino lechon, and the water fowl skin seems like a lightweight. It's like O'Douls next to a pint of Guinness. A Lay's chip next to a Kettle Brand. William Baldwin next to Alec Baldwin. You get the idea. A place that does duck right and not with that crappy steam bun. I love duck, though I tend to prefer the confitted variation, this looks mighty good! Don't think I've ever had "proper" Peking Duck yet. Very few restaurants even offer duck, at least not here behind the OC curtain, sadly. Does anyone think this whole "its takes an HOUR to make" thing at these places that make these duck dishes is a load of crap? I mean, if you serve that much duck, wouldnt you have a few cooking throughout the day? When you go to those "hanging animal" places you can get a duck with crispy skin in a matter of minutes! I love how the food is preseented at the Duck House. I love your pictures. It looks delicious. I love your blogs. If you wont mind I'd love to guide Foodista readers to this post.Just add the foodista widget to the end of this post and it's all set, Thanks! 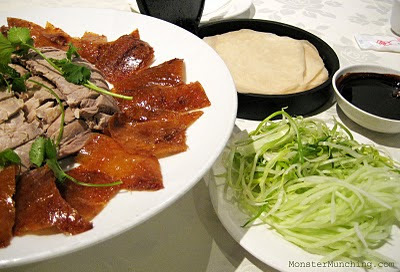 Mmmm, I love Duck, Peking/Beijing style. I've been to Quanjude; which is good but a true tourist trap like Da Dong... Been to others in Beijing less targeting tourists like Liqun. Really miss having that here... Will give this one a try next time I'm in the SGV area. BTW: I went to Peking Gourmet Inn in Virginia (outside DC in Falls Church). For a US Beijing duck place it was pretty darn good. I never have heard of this restaurant before and now I want to try it! The duck looks so pretty- no wonder why it costs so much. Ah yes! Agreed. It's not that I don't like those steamed buns, it's just that these thin crepes are much better to savor and actually feel the crispy skin. Tell me about it. I'm sure there is a place in OC somewhere that can do a proper Peking duck that can rival or match this, I just haven't found it yet. Besides I just had to break out and see the world. SGV is like going to another continent...Asia! Yep, like I said in my write up, they had all the ducks ready to go. They were just building it up because...well, I don't know why. I mean, we were already sitting there. We wanted the duck. We weren't going anywhere else. This is the place among all places (at least right now) to get this dish. But if you're hankering for pork skin: get thee to a Filipino joint that does lechon! I'm not in the D.C. area much, but I'll have to keep that in my back pocket for when I am. Thanks! Actually, I went and searched your site before I ate here to see what you thought of it! But yes, it's quite good if you like Peking duck. By the way, even if you don't get the Peking duck, the place is not cheap. Yes, I got that impression, but then again it's the best that I've had so far! When you see something that trumps it, let me know! Duck House / Lu Din Ji makes outstanding duck webs with Chinese mustard (芥末鴨掌). Traditionally, this dish came with those "crappy steam bun" which is how it was always served to me for 50+ years of Cantonese banquet dining. I think the Taiwanese use the tortillas, which I do not prefer. The steamed buns are awesome when properly served piping hot, sadly if you get cold or room temperature buns, then they are not great, just okay. Also, I personally prefer some of the duck meat and fat left on the skin, but that's just me. Lu Din Gee's duck was not how I am used to being served so I was less than impressed and not interested in returning. Pretty much any downtown Chinatown restaurant serves Peking Duck the way I prefer it, but this is totally subjective. Duck webs! That dish should be more popular solely on how fun it is to say. Duck webs! So true that it's all subjective. It's almost like ribs in America. You can't get two people to agree on how best to eat ribs. I'm a fan of Peking duck... heck anything duck. I'll have check this place out next time I'm in the area. You should! Another one that I've had since this post is in Irvine at a place called Tri-Village. Simply. Awesome. Try Ji Rong Peking Duck, 8450 Valley Blvd, Rosemead CA 91770. 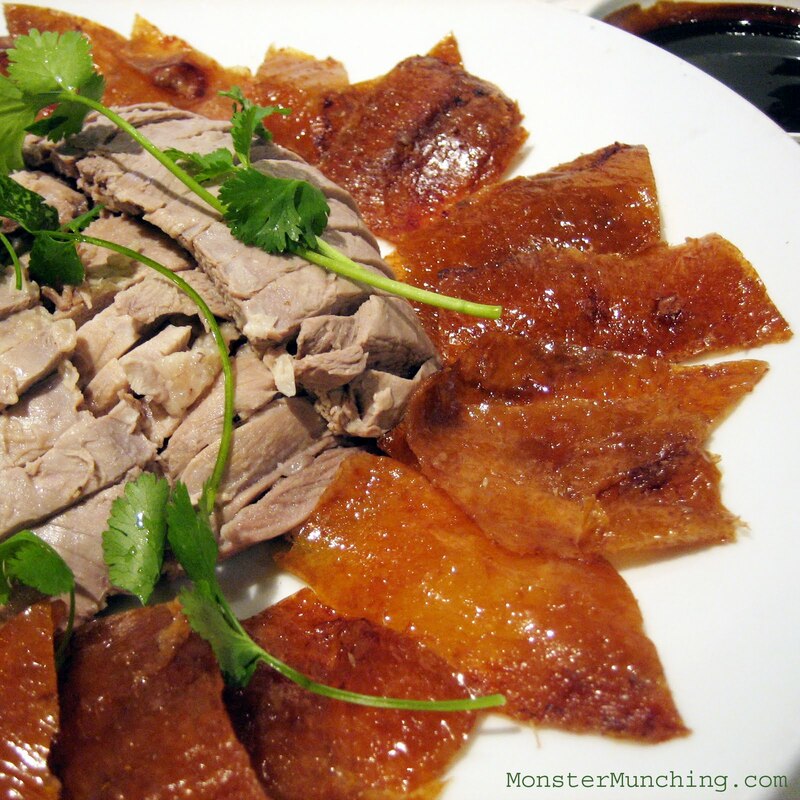 The picture on Yelp shows the duck skin thinly sliced and not fatty--looks delicious! I prefer thin crepe or pancake than steam bun which makes your mouth dry and too much bread to enjoy tasting the duck skin and meat.